Say Goodbye to Partial Dentures! With partial dentures, you have an appliance attached with metal to your surrounding remaining teeth. The gum portion is an uncomfortable plastic that will irritate your gums and make it difficult for you to speak. This apparatus needs much care, careful handling and daily removal for cleaning. And, as a result of aging, your jaw will change shape and size, requiring you to be re-fit for yet another set of partials. Why go through all this difficulty when there is a hassle free permanent solution? Imagine being able to have your real teeth back again? It is possible with permanent dental implants. With permanent dental implants, each individual tooth has a root system implanted into your jaw and topped off with a beautiful porcelain tooth at the gum line. The tooth has a natural shape and feel. Nothing could be closer to the real thing than a dental implant. With permanent dental implants you will have no more difficulty speaking; no more aging appearance from facial structure changes; no more daily removal of denture apparatus for cleaning. Dental implants are cared for just like your own teeth. You must floss and brush daily to maintain optimum oral health care. Make that Life Changing Call Today! Top New Jersey dentist, Dr. Ron Rotem, has been helping people get back their natural smile for nearly 20 years. As a highly respected professional and member of the Ocean County community, Dr. Rotem is thought of warmly by his patients. They know that Dr. Rotem’s professional care comes from his vast knowledge of implant dentistry and his personal desire to help people feel better about themselves. 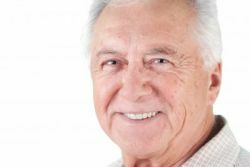 You too can find out how great it feels to have your natural teeth back again and say goodbye to partial dentures. Call Dr. Ron Rotem today and make the switch from plastic partials to permanent dental implants.